In the face of the global financial crisis, central banks have used non-standard and unconventional monetary policy instruments. Firstly, they implemented the interest rate policy, lowering base interest rates to a very low (zero or—in some cases—even negative) level. In the lack of expected results, they also decided on Quantitative Easing policy. However, some of them in the following years did not undertake normalizing activities. The main aim of the study is identification of major categories of risk, accompanying the normalization process of modern central banks. 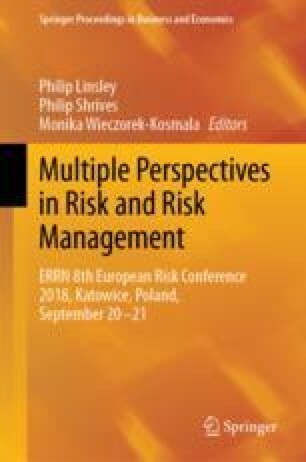 Methodology used in the research mainly based on theoretical analysis: selection and discussion of theoretical material and descriptive material, in context, and detailed comparison of risk accompanying individual central banks. The central bank’s risk may concern timing of normalizing activities. Too fast phasing out of non-standard instruments can threaten the growing economic growth. While, their too late implementation may pose a risk for long-term macroeconomic and financial stability. An important area of the research, undertaken in the study, is the risk of central bank’s balance sheet normalization. This process may take place through active approach—resale of assets, purchased previously by central banks, or passive approach—holding them in the balance sheet until maturity.